Looks so sweet! 💙 I can't wait for the wedding episode tomorrow! Counting down the hours! Bobby and Tori are such an amazing couple! I can't wait for the wedding episode! Is there anything more radiantly beautiful than a joyous bride? 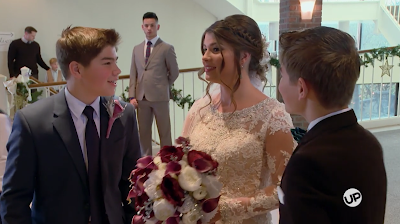 The attendants all look wonderful, but Josie is absolutely dazzling in this footage. Tori looks so gorgeous in her dress! It will be a beautiful wedding to watch full of special memories! Can't wait for tomorrow. Tori looks beautiful and her brothers are very sweet with words of wisdom. Why can I always watch the commercials before the video but when the episodes comes on the screens goes black? Can’t wait to see this tomorrow night! I LOVE Bringing up bates! I can't wait for the wedding episode tonight! I am so excited for the wedding episode! I can't wait for the wedding! Is it the last episode of this season? If it is I will be sad. I am disappointed in the way Tori and Carlin act.